No, the T-GT is not a direct drive wheel, a rumor that had legs thanks to lost in translation comments from GT Creator Kaz. 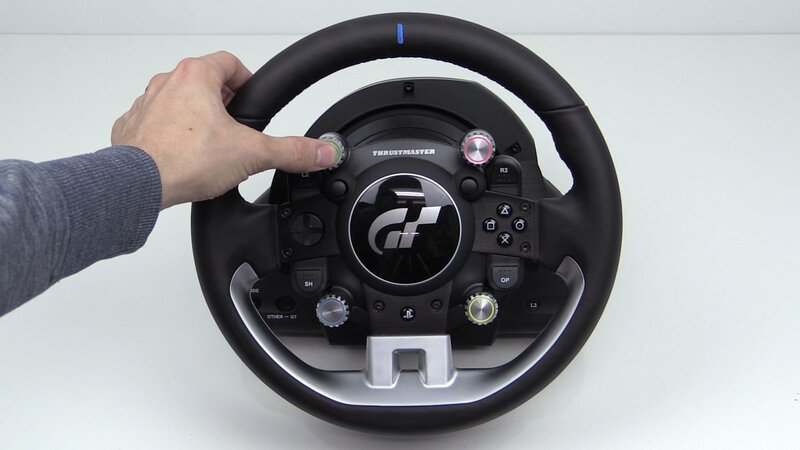 But it is the best wheel base that Thrustmaster has ever made. While Thrustmaster wheels usually sacrifice some smoothness for road feel, the T-GT does not. It is a fair amount smoother than the previous smoothest wheel, the TS-PC / TS-XW Racer twins, and you rarely feel any bumps or cogs when you turn the wheel. It accomplishes this without deadening the feel either, giving you the best of both worlds, detail and smoothness. As for force feedback, it is also a step up from the TS Racer twins. We drove the T-GT and TS-XW back-to-back – with the Sparco P310 Competition wheel on the T-GT to eliminate the effect of a smaller diameter wheel – and the T-GT’s force feedback was about 20% stronger. The bump in force feedback isn’t nearly as notable as the smoothness, but it is an improvement nonetheless. And if you’re curious, the force feedback difference between the 28 cm T-GT wheel and the – easier to turn – 31 cm Sparco P310 Competition wheel wasn’t much, which goes to show you the strength of the T-GT wheel base. Clearly the T-GT is the official wheel of Gran Turismo Sport and we’re not just saying that because it has a big “GT” logo on it. 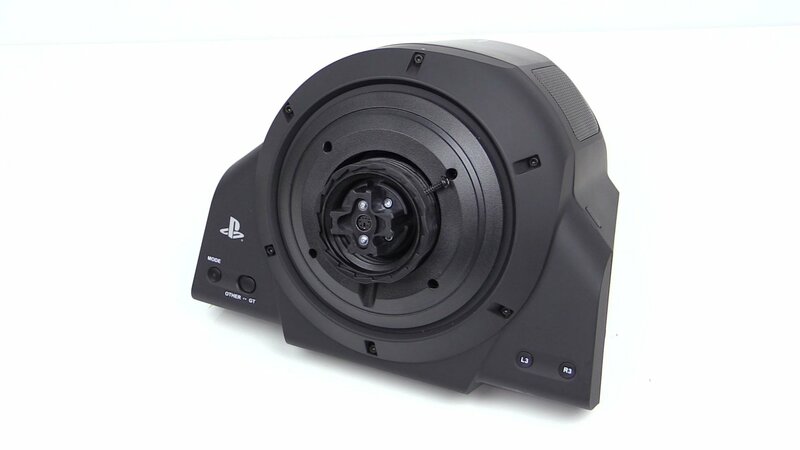 While all the standard PS4 controller buttons make their way to any compatible PS4 wheel, none of them have both the left and right sticks. The “mini sticks” on the wheel not only give you another way to navigate, but more usefully, make painting and taking pictures much easier than any other wheel. Without the T-GT, you’re better off going to the PS4 controller to paint or take photos. But outside of that, what else does the T-GT offer for GT Sport? Depth Feedback. Depth Feedback adds suspension and vibration effects via the steering column. It’s a pretty cool effect. As the car speeds up or goes over rumble strips there’s a low frequency vibration that you not only feel in your hands but – if you have a simulator – can feel through your seat and pedal plate. 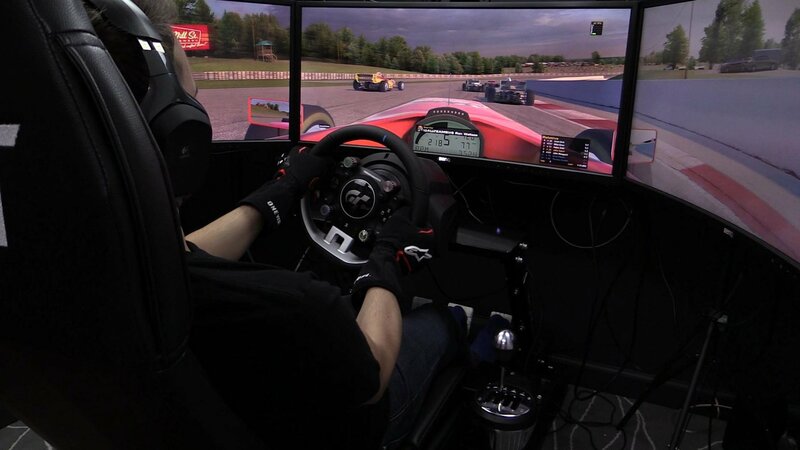 I was very impressed how well the sensation was felt across my entire Next Level Racing F1GT rig. It’s very SimXperience SimVibe like – albeit not as strong – but doesn’t require you to get a PC and all the other peripherals needed. 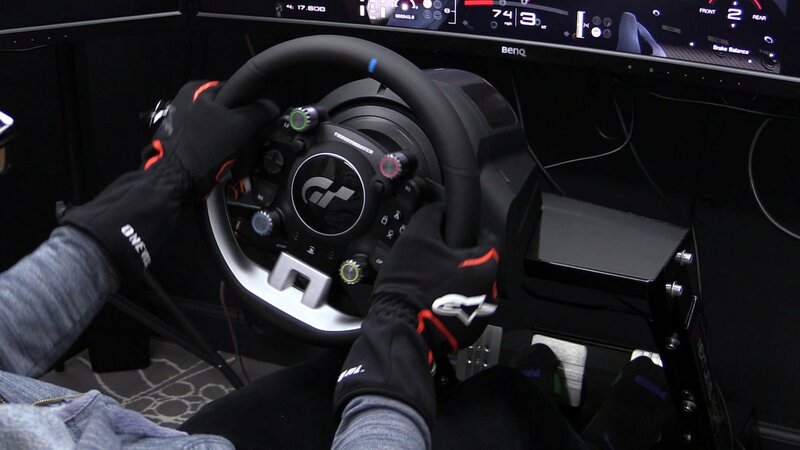 For Depth Feedback to work the wheel must be in “GT” mode and GT Sport is the only game that features it. Hopefully this effect can be supported in other titles in the future because it’s certainly a cool sensation, but for now, a GT Sport exclusive. T-GT wheel base design is functional, but not very exciting. It’s smaller and lighter than the TS Racer twins, which is nice for a PS4 compatible wheel that might be getting moved around a lot. It has a nice metal base with padded feet that can be secured via the included clamp or INCLUDED M6 bolts and round feet for them as well. It’s nice to finally see a wheel come with bolts, saving customers from having to run to the hardware store when their new baby arrives. Lastly of note, is an I/O featuring modular power, USB, pedal and shifter connections. So while that is all good, the T-GT isn’t the most exciting looking wheel base out there. 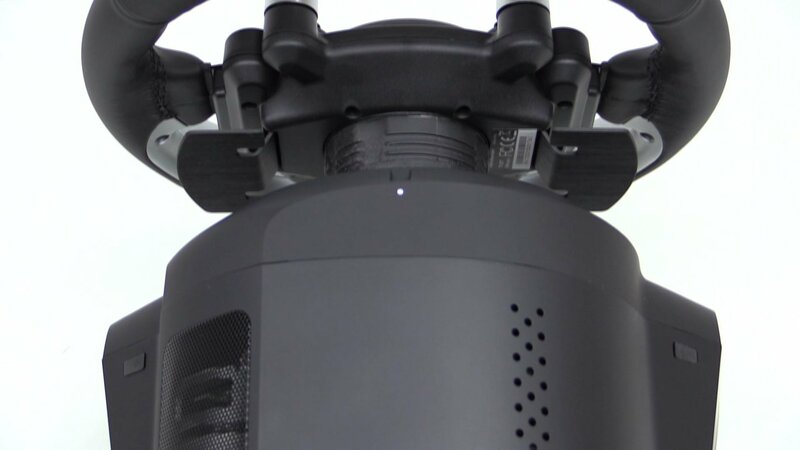 The casing is entirely made of black plastic sans some metallic mesh for cooling. The rounded, non-symmetric, shape isn’t awful but isn’t the prettiest either. The most interesting design element of the wheel base is actually the part you’ll see the least, the Depth Feedback transducer on the back. All-in-all it’s a just okay looking, especially when next to the TS Racer siblings with their angular design and metal inserts. The options and settings for the T-GT mirror all the other Thrustmaster wheels. You can change the degrees of rotation on the fly by pressing the “Mode” button and left or right d-pad at the same time to increase or decrease it by set increments such as 360, 540, 720, 900 degrees. This comes in handy for games like GT Sport that do not have any degrees of rotation adjustment. Outside of that are the usual setting in the Thrustmaster Control Panel. We were able to up the force feedback strength to 100% without any issues from the default of 75%. And Public Service Announcement, even if you only plan to use the wheel on the PS4, hooking it up to the PC, adjusting settings and installing the latest firmware and driver is a good idea. The T-GT steering wheel is a mixed bag. On the positive side, all those buttons are awesome. 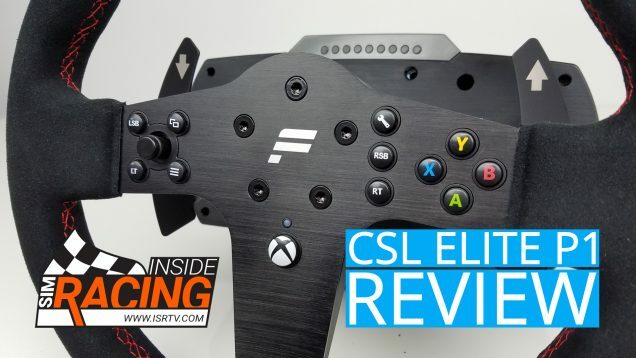 There are 12 push buttons (not including the PS button), d-pad, 2-mini sticks and – my personal favorite – 4 machined aluminum rotary selectors with 12 positions and push function. All the buttons have a nice resistance to them, particularly the L2, R2, Share, and Options buttons, and the rotary selectors feel great to the touch and are very positive in both rotation and push function. I loved being able to toggle through the bottom right menu in GT Sport by pressing the bottom right rotary selector and then rotating it to adjust things like ABS, Traction Control and Fuel Usage. Outside of GT Sport – which quite frankly didn’t utilize all the buttons – and to PC land, the amount of buttons on the T-GT might give you pause if you were thinking about picking up a button box. Between the number and variety of buttons, only the most complicated cars – like modern F1 cars – might demand more buttons. Outside of that, there are plenty enough buttons to map. On the not so positive side, the 28 cm leather wrapped rim is an issue. The 28 cm rim just looks and feels small. If it was an F1 like rim, I think I could live with 28 cm. But for a traditional shaped wheel, I want it to be at least 30 cm in diameter. Oddly enough, in speaking with Thrustmaster at E3, the 28 cm diameter was a pushed from Polyphony themselves. Maybe they wanted to maximize force feedback strength? Either way, it feels small. Also not helping the size issue is the feel of the rim. After some really great, meaty and supportive, rims from Thrustmaster such as the 599XX Evo 30, TS-PC Racer rim, and Sparco P310 Competition, the T-GT rim feels underwhelming. While the leather is nice, there isn’t much padding underneath it, making the rim a bit hard and not nearly as meaty as I would like. Also not helping the feel is the silver plastic accent on the bottom. There are countersunk bolts on the backside of the rim securing the silver accent piece. When you’re driving your fingers touch the top bolt hole and that doesn’t feel great. Then there’s the question of the piece from a design standpoint. I don’t think the T-GT is a bad looking wheel but I think it would look more high end without the plastic silver accent and large GT branded center hub. These plastic pieces take away from the quality materials such as the leather on the rim, the metal wheel spokes and the nicely machined rotary selectors. The T3PGT pedals are fine for their price, but aren’t nearly to the level of the T-GT wheel. Having a bundle that allows you to race out of the box is good, and the pedals, with the conical brake mod installed are good enough to get the job done. 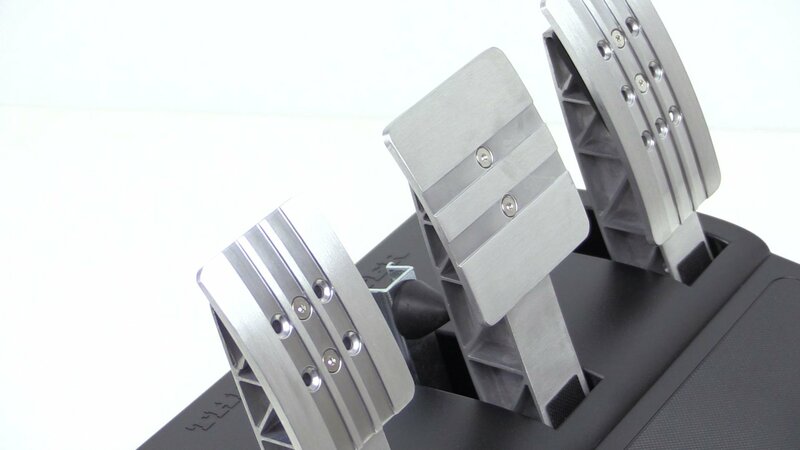 But for a wheel of the T-GT quality and price, nicer – load cell – pedals are needed. A load cell brake pedal that translates how much pressure you apply to the brake, rather than how much distance the brake has traveled, is just so much more intuitive and better feeling. It is a must at this price point. Which brings us to price. For as nice as the T-GT wheel base is and how slickly it’s integrated into GT Sport, $800 is a lot of money for a package that has okay pedals and 28 cm rim. 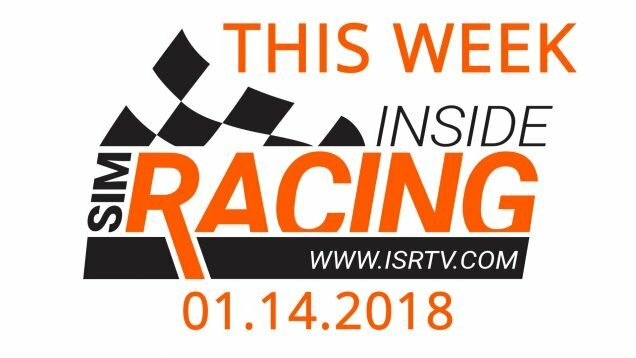 For that kind of money there needs to be a very high quality experience across the board from wheel base to wheel to pedals, and while the wheel base possess that quality, the other two components do not. If you’re ride or die for GT Sport, then the T-GT is worth giving a look. The buttons provide you the most user friendly experience out there and the vibration that Depth Feedback sends through your rig is really cool and well done. But outside of GT Sport, the T-GT becomes a much harder sell. The steering wheel is just too small. 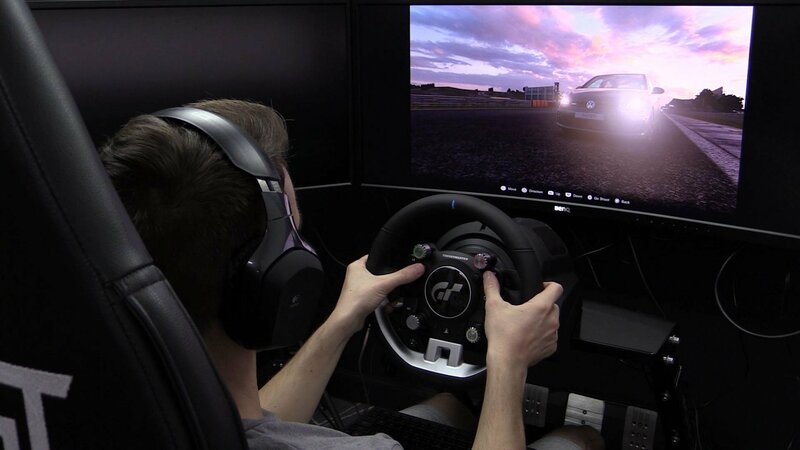 It’s a disappointing design choice by Polyphony, especially in lieu of our testing in which the larger diameter P310 Competition wheel only slightly reduced the force feedback of the base. The pedals are also an issue. For the price and quality of the wheel, the brake pedal needs to have a load cell. Sure the T3PGT’s are competent, but I certainly struggled going back to pedals that just measure distance traveled.